A newly applied technique for analysing the â€˜hobbitâ€™ bones found on the Indonesian island of Flores strongly supports the theory that the remains come from a new species, potentially overturning longstanding ideas about human evolution and dispersal. Anthropologist Debbie Argue from The Australian National University has led a new research project comparing characteristics of Homo floresiensis bones to those of other early hominin species to build up a picture of where the hobbit sits in the evolutionary tree. 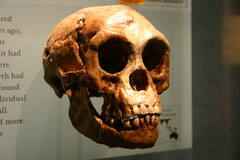 The team used â€˜cladisticâ€™ analysis â€“ the first time this has been used in relation to H. floresiensis. It is an approach that compares the forms of organisms to determine ancestral relationships. The results â€“ published in the Journal of Human Evolution â€“ suggest that H. floresiensis diverged from the Homo sapiens evolutionary line in the Early Pleistocene, or even the Pliocene, nearly 2 million years ago, meaning that it did not share an immediate ancestor with modern humans.